Dr. Lederer is the Optical Measurements Lead Scientist in the Orbital Debris Program Office (ODPO) at JSC. Optical measurements include ground-based telescopic measurements as well as laboratory measurements that are designed to understand the orbital debris environment in Geosynchronous (GEO) orbit and Low Earth Orbit (LEO). Photometric and spectroscopic measurements and analysis of debris found in GEO orbits are designed to characterize the size, composition, orbits, and population in GEO. Observations are obtained with the 0.6m MODeST (the Michigan Orbital Debris Survey Telescope), the SMARTS 0.9m, and the 4m Mayall telescopes (all at Cerro Tololo Interamerican Observatory (CTIO)), and both 6.5m Magellan telescopes at Las Campanas Observatory [all in Chile], as well as the 3.8m UKIRT infrared telescope in Hawaii. Dr. Lederer is also the PI for the Meter-Class Autonomous Telescope (MCAT) project at Ascension Island. This will be a dedicated 1.3m optical telescope designed to probe GEO, GTO (Geo-Transfer Orbits) and LEO (Low Earth Orbit) environments through optical photometry. Dr. Lederer leads research in planetary science with emphasis on comet and asteroid investigations. Projects include: (1) Investigations of effects caused by collisions between comets. The Experimental Impact Laboratory at NASA JSC is used to impact minerals found in comets/asteroids to determine effects due to collisions as seen in infrared spectra and Transmission Electron Microscope imaging for comparison with telescopic data; (2) Investigations of the rotational periods of Trojan asteroids to gain insight into their histories, using telescopes at CTIO and Lowell Observatory in Flagstaff, AZ. 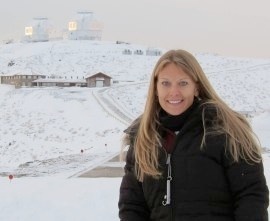 Prior to her tenure at Johnson Space Center, Dr. Lederer was an Associate Professor of Physics at California State University SB, faculty of the 2010 Vatican Observatory Summer School in Italy, and a National Research Council Post-doctoral Fellow with Dr. Faith Vilas and the Planetary Astronomy Group at NASA Johnson Space Center. Her research focus was on small bodies during this time, including involvement in the Japanese Hayabusa Spacecraft Mission to Asteroid 25143 Itokawa, the Deep Impact Spacecraft mission to Comet 9P/Tempel 1, and the Spitzer Space Telescope, and plenty of ground-based observing.